The state-of-the-art food testing laboratory services will help minimize potential hazards, protect consumer’s health from unwanted food safety scares, and improve health and wellness by maintaining nutritional levels as per MDM guidelines. The food testing services cover multiple chemical, microbiological, physical, and sensory examinations (more than 60 parameters) to analyse and ensure the safety and quality of raw materials and finished products. The min lab involves at every stage from the food supply chain to state-of-the art facilities to ensure compliance with international regulations governing issues such as chemical residues, pathogenic bacteria, allergens, additives, and nutritional content. 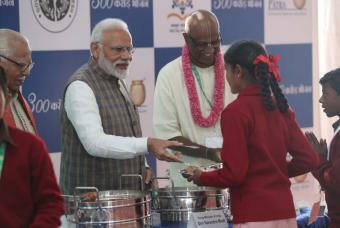 The Akshaya Patra Foundation’s Lucknow Laboratory will cover 20 kitchens pan India and conduct more than 50 analyses per day. The first Food Safety and Quality Control Lab opened last year in Ahmedabad has completed 5,000 plus analysis of various raw materials and finished products.